IN MEMORY: Phil Jacobson APM is fondly being remembered as a man who served his family, the Police Force and his community. With regret I advise the death of Phillip Keith JACOBSON, 59 old, former Regd. No. 16117, a non-member of the RPA of Sawtell. Phillip passed away on 11/09/2014 and his funeral is proposed to be held at 10.30am on Thursday 18th Instant at St. Augustine’s Catholic Church, Gordon Street, COFFS HARBOUR. IN the measure of the man, a large crowd today celebrated the life of Phil Jacobson in Coffs Harbour. 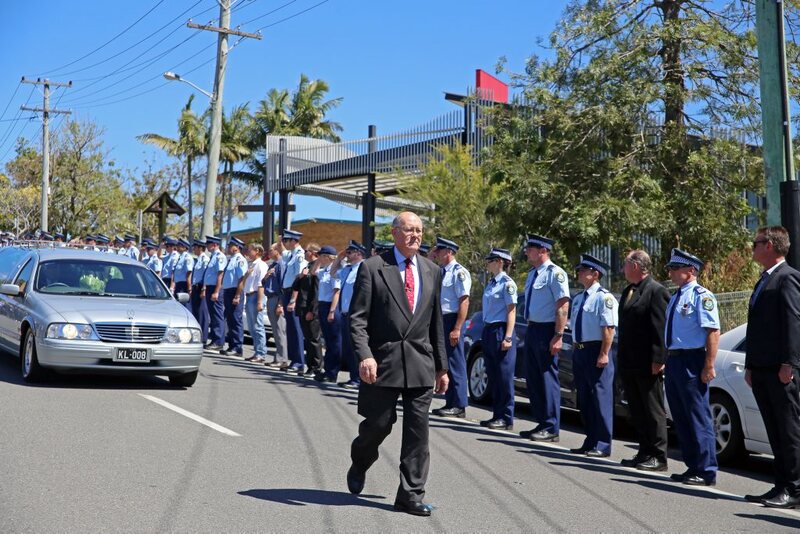 Family and friends were joined by retired, former and serving police officers, who paid their final respects to the dedicated family man, decorated former police officer, surf club stalwart and revered Sawtell community leader. In testament to the life Phil lived, and the generosity he shared throughout his 59-years, there was standing room only at Coffs Harbour’s St Augustine’s Catholic Church. Phil is survived by his partner Suze, and was the loving father and father-in-law of Louise and Nifty, Mark and Amy, Kurt and Amy, Alicia and Ben, Bianka and Rebecca and Ronnie. His children remembered an extraordinary man, who as a young father and sole parent served as a police officer while raising five children, then aged between 27 months and 13, following the sudden death of their mother Annette. “Your memories will live on forever,” the family wrote in tribute to the beloved ‘Pa’ to six grandchildren. “As police officers we are aware that incidents occur or matters arise that simply do not make sense or cannot be explained. The death of our esteemed former colleague, our mate, Phil Jacobson APM is one of those events,” Coffs Clarence Local Area Commander Mark Holahan said. “His loss is devastating to his immediate family, his communities that he served so selflessly, his friends and his police family. It is hard to understand why a good man is taken from us so early. Phil served as a police officer for 41 years and he arrived on the Coffs Coast in 1983 from Cobar. “His experience, knowledge and personality endeared him to all his colleagues,” Supt. Holahan said. “His well developed sense of community saw him involved in many and varied interests including developing young people in rugby league and surf life saving. “He carried this into the workplace and was able to coach and mentor many young police, probably hundreds in this command. “He was an officer with a great deal of commonsense, loyal and trustworthy. “Apart from his family, policing was his love. “His overall ability was recognised in 2009 when he was awarded the Australian Police Medal for distinguished service in the Queen’s birthday honours list. For Phil this was a humbling experience. “Not often is a Senior Constable awarded this award. “For me as his Commander it was a well deserved honour, rightfully awarded to a more than worthy recipient. “Phil’s presence in the workplace was reassuring, what we saw was what we got and how we miss it and him since his retirement. “Rising to meet personal tragedy, passing on his life experiences to others and his engagement with his community, a police officer of the calibre of Phil cannot be replaced. “His passing is a great loss to many. Quite simply it hurts. It is not fair. His life though, is an example. “The people he has touched, the lives he has changed the difference he has made, that is his legacy. Many fond memories were shared of Phil’s time as a tireless servant for the Sawtell Surf Life Saving Club, the Sawtell Golf Club, Apex and the Sawtell Panthers Rugby League club. Great mate Jason Breton, who served with Phil for a decade at the Coffs Harbour Police Station, remembered a man who always put others before himself. “It’s strange in a way, but now that Phil is gone he is a better man, but then again we always knew that,” Jason said. “He was an authority on policing, a man who was above title, there was no demarcation of rank when it came to Jaco, he was the man everyone looked up too for advice in policing and in life. “Not too many senior constables have ever won the Australian Police Service Medal, but Jaco set the example. “He was an exceptional police officer and an exceptional person. “Even the crooks couldn’t help but like him, that’s what sort of bloke Jaco was, a true gentleman in every sense of the word,” he said. Phil Jacobson was laid to rest this afternoon at the Coffs Harbour Lawn Cemetery at Karangi. PHIL Jacobson APM has been remembered as ‘a man who put others before himself’ following his sudden passing this week. A dedicated family man, community leader and decorated former police officer, the 59-year-old retired from duty as a Senior Constable last year after 41 years with the NSW Police Force. Coffs Clarence Local Area Commander Mark Holahan said Phil’s passing had devastated his immediate family, friends, the communities he served so selflessly and his police family. “It is hard to understand why a good man is taken from us so early,” Supt Holahan said. “The worth of a person is not the length of time they live. “It is how they live their life, the legacy they leave and whether they have been good and virtuous. “Perhaps Phil would have changed a few small things, but not too much. “His life, as short as it was, was rich and rewarding. Rising to meet personal tragedy, passing on his life experiences to others and his engagement with his community, a police officer of the calibre of Phil cannot be replaced. In 2009, Phil was awarded an Australian Police Medal in the Queen’s Birthday Honours for his work as a domestic violence liaison officer. He was also a long-serving member of the Sawtell Surf Club, the Sawtell Golf Club, Apex and the Sawtell Panthers. 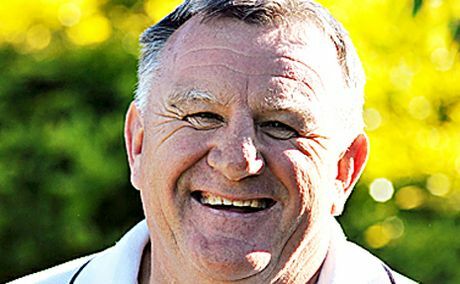 Born in Narromine and a gifted rugby league player, Phil played in the Eastern Suburbs Roosters’ 1976 premiership-winning Under-23s side. After five years in the job at Cobar, Phil settled in Sawtell with his wife Annette and their young family in 1983. Friends say they realised Phil’s true strength of character when as a single father he raised his five children. In his last interview with The Advocate last September, Phil reflected on his family, career and retirement. “Annette was 30 when she passed away and the kids were aged between 27 months and 13,” Phil said. “I owe a lot to my parents, who helped me raise the family, the police department was remarkable and the police commanders I served under allowed me to work split shifts and early mornings to spend that valuable time at home. “Being a father is the best thing I’ve done in my life and I’m the proud grandfather of five. “I would like to thank friends and acquaintances both in and outside the police for their support over the years. Thanks, I’ve really enjoyed the journey,” he said at the time. Phil Jacobson, Police Officer, single father, community all-rounder, 2012 Sawtellian of the Year winner and just a breat bloke. Here we find out what motivates a man to continue giving to his community. HIS mates say he’s a man “who never says no to doing a favour” and as a police officer Phil Jacobson has done his duty. The decorated Senior Constable has called it a day retiring from the New South Wales Force after 42 years service. As a hard running centre, he played in the Eastern Suburbs Roosters’ 1976 premiership winning Under 23s side and went on to play two seasons in reserve grade. After five years spent in the job at Cobar, Phil settled in Sawtell with his late wife Annette and their young family. “I owe a lot to my parents who helped me raise the family, the police department was remarkable and the police commanders I served under allowed me to work split shifts and early mornings to spend that valuable time at home. Voluntary work in Sawtell has also been close to Phil’s heart, serving with Apex, volunteering at the Sawtell Golf Club and surf club and coaching junior teams with the Sawtell Panthers. Reflecting on his career, he says policing is all about “upholding the law and public trust”. “As police officers we deal with people who find themselves in complex situations on a very personal level. “Our role is to help and protect and through the job I’ve met a lot of good people over the years. Phil Jacobson is congratulated by Coffs Harbour City Council Mayor Cr Keith Rhoades after being named Sawtellian of the Year. ACCORDING to organisers of the annual Sawtell Fun Day, this year’s choice for Sawtellian of the Year was fairly simple. 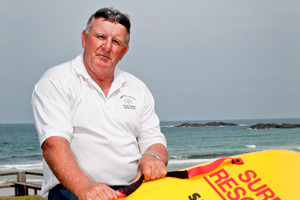 Although a strong field of nominations was received, organising president Warren Hollyman said Phil Jacobson was a more than deserving winner due to his heavy involvement in the Sawtell Surf Life Saving Club and Sawtell’s junior rugby league as well as his interest in doing community work as part of his role as a police officer. “He (Mr Jacobson) is a very good community guy,” Mr Hollyman said. 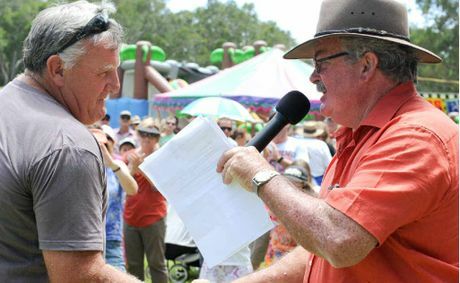 Mr Jacobson was presented with the award on New Year’s Day at the Sawtell Family Fun Day and was congratulated by many members of the large crowd at the successful event. Aside from bestowing the annual honour on Mr Jacobson, the organising committee for the day was thrilled with how well the Fun Day went – the 92nd time it has been held. “We put a lot of work into it and our sponsors are unbelievable,” Mr Hollyman said. WHEN Phillip Keith Jacobson put his career on hold to raise four children as a sole parent, he expected little reward.But today the senior constable is being recognised for his “devotion to the community” and “selfless sacrifice” with an Australian Police Medal often reserved for those of higher ranks. 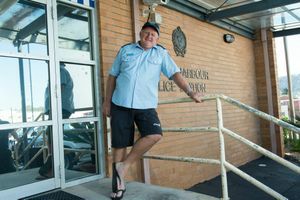 The man, who had become a police officer by default and nearly quit when his wife died, has been a highly respected domestic violence liaison officer in Sawtell, near Coffs Harbour, for almost seven years. Jacobson says he knew it was a field in which he could make a difference: “It gives me great satisfaction that I meet people when I first came across them, they were despondent, down-and-out, distrusting … to be able to see them blossom. A local women’s refuge and family centre supported his nomination, highlighting his “kind manner, professional knowledge and ability to help those most in need without discrimination”. In 1991 he wrote his resignation. His wife Annette had died suddenly of a cerebral hemorrhage at 30, leaving him to raise four children aged 27 months to 13. But his parents, friends and the “crew in blue” came to the rescue. He opted out of the promotions system and was granted permanent day shift so he could spend time with the children. “I’m eternally grateful to my Mum and Dad … They put their life on hold,” he says. 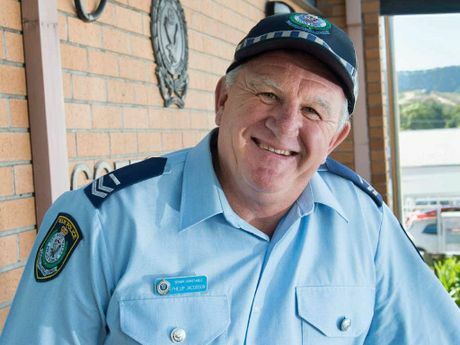 PHIL Jacobson has given his all as a policeman on the Coffs Coast. So much so the 54-year-old senior constable featured in today’s Queen’s Birthday honours with an Australian Police Medal (APM). “It’s recognition I suppose of doing your job to the best of your ability,” Phil said. Phil is the Coffs/Clarence domestic violence liaison officer (DVLO) and according to his citation, it’s a role in which he’s excelled, ‘receiving the respect of his peers, his supervisor and his commander, as well as serving the North Coast community, especially those in need’. “I’m assisted in this work by local agencies and organisations which are very committed and very passionate,” Phil said. A young Phil left Narromine for the Big Smoke initially to play league with the Roosters and his under 23s would go on to win the competition in 1976. He’s been a member of the NSW Police Force since 1972 after serving as a cadet at the tender age of 17. He spent his first years of service at Darlinghurst and Kings Cross before transfer to Cobar in 1978. In 1983 he arrived at Sawtell Police Station where he was the lock-up keeper ahead of his 1990 transfer to Coffs Harbour. The following year, his wife, Annette, died. Phil stepped up from general duties policing to a 13-year stint with the intelligence division, followed by his appointment to the DVLO post. Chief Inspector Shane Cribb from Coffs Harbour police described Phil as a ‘very knowledgeable, approachable and team-orientated’ officer. Phil, a father-of-five, is also heavily involved in his community. He’s spent the past 15 years with Sawtell Surf Club – where he’s a patrol captain – and has coached juniors and under-18s for Sawtell Rugby League. And is active in another sport where he remains an active junior rugby league referee.